What’s the point? I had three calls from friends and customers AGAIN this month wanting to know if the Boonville sale barn was really closing like they had heard. The point to my story is that the Boonville sale barn will be open for many, many years, but if anything ever changes I will be the first to let you know. So the next time someone says that, you ask them if they got it from CNN or if they read it in this paper – if they didn’t read it here then you will know they are only peddling fake news. Many years ago I worked with a very wise old man named Billy Wade. 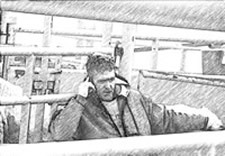 Any of you who frequented the Columbia Livestock Auction I’m sure will remember him. Billy being a child of the depression era had a very bleak saying, “ it hasn’t ever got so bad that it can’t get worse.” For our friends family and fellow cattlemen in Nebraska this has become the reality. In Eastern Nebraska and South Dakota 2 inches of rain on top of 3 feet of snow with a concurrent snowmelt that adds 6 inches of liquid on frozen ground is obviously a formula for disaster. Western Nebraska and Western South Dakota had a different set of circumstances. 2 feet of snow with 50 mile an hour driving winds. A blizzard at absolutely the worst time for cattleman there who had begun calving. My cousin Tim lives in Lincoln, Nebraska and works for a large co-op. He has a customer who had 50 cows and calves completely washed away overnight. And unfortunately the devastation is not limited to those western states. We have customers here that will endure/suffer at least a 20% death loss. In extreme cases, but not necessarily unusual cases, death loss will exceed 80%. Billy Wade had it right, but the flipside of that coin is it hasn’t ever been so bad that it doesn’t always get better. Spring is coming. I wonder what the long term effects of the last year will be for our industry. I know many people that are calling it quits and I know many other people who are going to give it one more year. Unfortunately in a year there will be several people who will have a bank make that decision for them. Hope is one of the most powerful human motivators behind love and fear. As long as we have hope, we keep going. So here it is; let me spread some hope. Historically all of this death loss and loss of beef due to weather induced lower carcass weights would be a no brainer bullish market signal. Unfortunately President Trump and our agricultural department is now allowing beef to be imported from Brazil and other countries nearly unrestricted. You can sheer a sheep and you can sheer a sheep again but you can only skin him once. Does anyone else get the feeling that we are in the process of being skinned? So where are we going forward? The jury is still out because if a trade agreement is achieved with China that includes unrestricted American exports of beef and pork to that country, we will not be able to produce enough to satisfy the potential demand of the 350,000,000 people that comprise China’s new middle class. I believe the likelihood of this happening is actually relatively high. To balance a trade deficit, we will have to sell them as much as we buy from them. Protein, especially very high quality beef (and pork), is really the only thing in this country that we produce that they strongly want. Some good news. With improving weather the market for feeder cattle and calves is also improving. As grass across the Midwest greens and begins to grow, demand will continue to improve. This increased demand due to available feed will extend into the bred female and pairs markets. Our pound cow markets have been relatively high for the last 2 months ($.50-$.70), however there is a likelihood with spring weather these markets may dip lower because of a buildup of cows (thousands of dairy cows) in northern areas of the country that have been prohibited from moving. More pressure will come when cows who have lost calves in this weather will be culled. Finally some may have noticed that I missed a sale last week. My old roommate from college has been working as a construction supervisor on the island of St. Croix for year. He has been trying since September to get me to come and visit… two-room condo with a view of the beach with temperatures ranging from 75° to 85°. At some point I finally got my affairs in order and said to hell with it ...I am going. I will have to admit I probably needed this more than I thought. The first night down here I slept almost 14 hours. Hopefully many of you are at some point able to take time off as well – after this winter and last summer we all deserve a break. Thanks for everyone who took care of things while I was gone. I’m sure like all vacations, it will be nice to get away, but better to wake up at home. That’s all for this month, I will see you at the auction. © 2019 The Cattleman's Advocate. All Rights Reserved.